Trichy: 14th October 2011:“The millions of out-dated, broken, obsolete, replaced electronic equipment as Electronic Waste (E-Waste) in today's world play a hazardous and destructive role in our day today life” said Dr.Arun Senthilram, the South India Coordinator of “Toxic Link’ Organization. Dr.Arun Senthilram delivered the key note address on E-Waste management and awareness for the students’ community in A.K.V.Matric Higher Secondary School in Trichy on Friday. 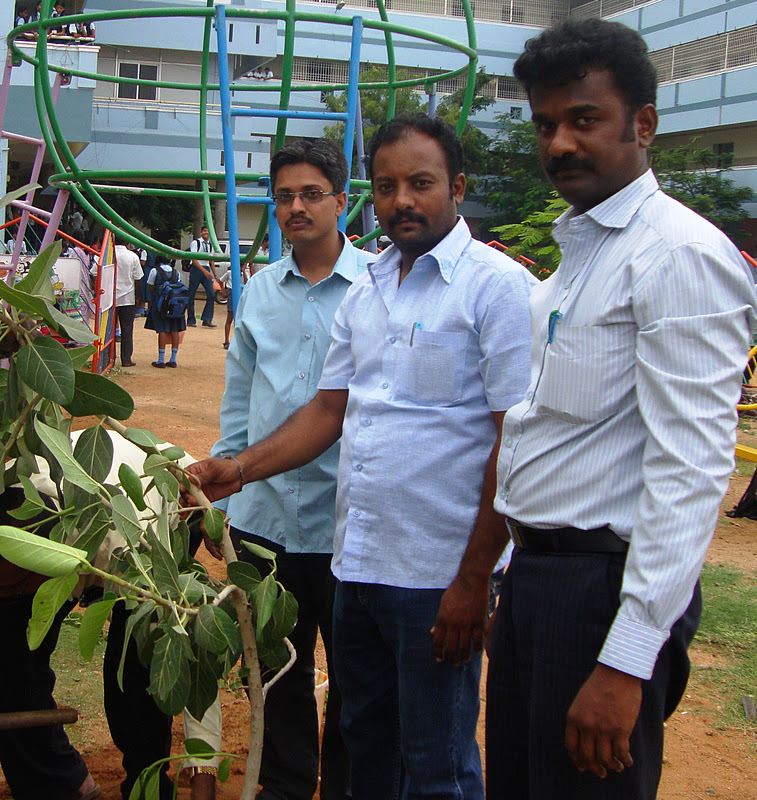 “Toxic Link’ Organization and Trichy Media Studies jointly organize such E-Waste awareness seminars for the students of around 25 such schools in Trichy city with the support of the offices of Inspector of Matriculation Schools of Trichirappalli. Dr.Arun Senthilram added, “ as per UN Statistics the Annual E-Waste of the globe is 1.84 Billion tonnes whereas India is to encounter 42 million tonnes E-Wastes. Any electronic equipment, from your television set, computer keyboard, wireless mouse, speakers, or hand-held video game player falls into the e-waste category. The sudden upsurge in our use of electronics in everyday life, and our lightening-speed ability to upgrade said objects makes for a vast rise in the number of electronic products biting the dust on a daily basis. Thousands of computers are thrown out every day including old cell phones, printers, fax machines, monitors, etc. All of these contain hazardous materials, usually in the form of plastics, lead, mercury, chromium, and cadmium. When these chemicals leak into the soil they will eventually begin to pollute our water. When looking at it in those terms, one can easily see the potential - and growing - problems with not disposing of e-waste properly. Part of the problem is lack of information - the average citizen has no idea about e-waste and the problems it is causing for our environment. Countries around the world are coming up with their own ways and ideas to combat this quickly growing problem”. The South India Coordinator of “Toxic Link’ Organization said further,” It has been estimated that 75% of electronic items are stored due to uncertainty of how to manage it. These electronic junks lie unattended in houses, offices, warehouses etc. and normally mixed with household wastes, which are finally disposed off at landfills. This necessitates implementable management measures. The management of e-waste should begin at the point of generation. This can be done by waste minimization techniques and by sustainable product design. Waste minimization in industries involves adopting: inventory management, production-process modification, volume reduction, and recovery and reuse”. Mr.Jayakumar, Inspector of Matriculation Schools who inaugurated this seminar enlightened that these days computer has become most common and widely used gadget in all kinds of activities ranging from schools, residences, offices to manufacturing industries. He further said, “Disposal of e-wastes is a particular problem. Computer wastes that are land filled produces contaminated leaches which eventually pollute the groundwater. If these electronic items are discarded with other household garbage, the toxics pose a threat to both health and vital components of the ecosystem. The Inspector of Matriculation Schools insisted that the awareness created among the student community should be disseminated to the rest of the public so that the E-Waste will be managed without much damage to the eco-system. Mr.Jayakumar further said that Eco-Clubs of the Schools are to concentrate not only on solid waste management and tree plantation and it should also focus on E-Waste Management and also to create awareness on this most vulnerable topic of unsafe conditions. Changes can be made in the production process, which will reduce waste generation. Mr.L.Shanawas Khan, Director of Media studies said that the e-waste of the school is to be kept in school waste bins in isolation for safe disposal and further said, “ the e-waste risk reduction can be accomplished by changing the materials used to make the product or by the more efficient use of input materials in the production process or both. Potential waste minimization techniques can be broken down into three categories such as improved operating and maintenance procedures, Material change and Process-equipment modification”-Govin.